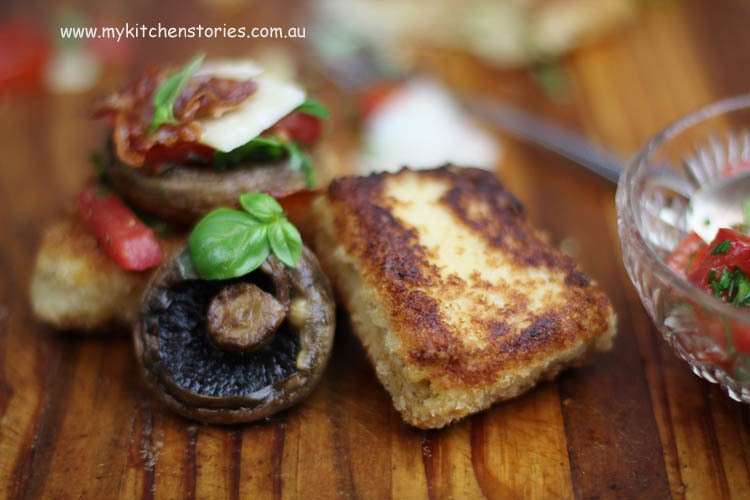 Creamy Crumbed Polenta with Goat Cheese. Polenta doesn’t have a huge fan base in my house. Funny enough though these little squares were gobbled up over several days by an array of teenagers who ate first and asked questions later. They were all surprised they had eaten both goat cheese and polenta and were keen for more. I love the art of food deception. ” What are these Mum?”. I have found that polenta is universally accepted when cooked with the right amount of cheese. Sure it’s not for everyday but it is a very delicious wintry treat. If you can get your hands on some organic polenta or course ground polenta you will notice how flavourful it can be. 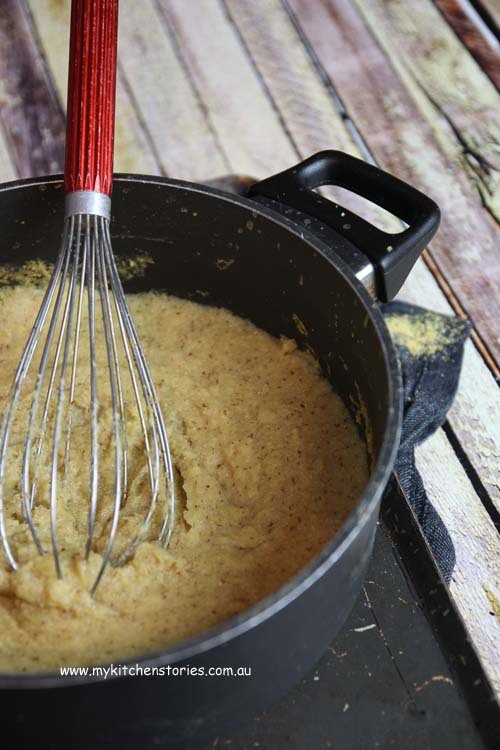 A lot of polenta is grown in the south western mountainous area of Trentino. This one is organic, made from air dried corn and it’s low heat milled. I dont find this polenta to take that much longer than a “quick cooking one” but boy does it taste different. I rain it into a pot of stock and stir before leaving on low and coming back occasionally to stir. No trouble at all. 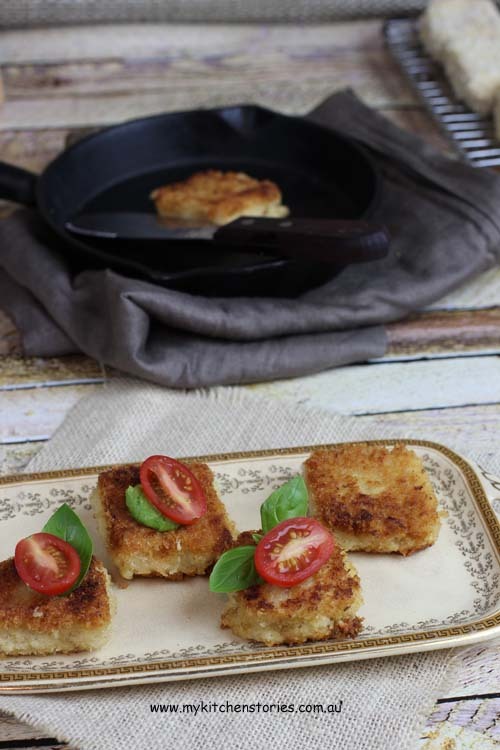 This style of crumbed polenta make great canapés or entrees or it’s even perfect for lunch. 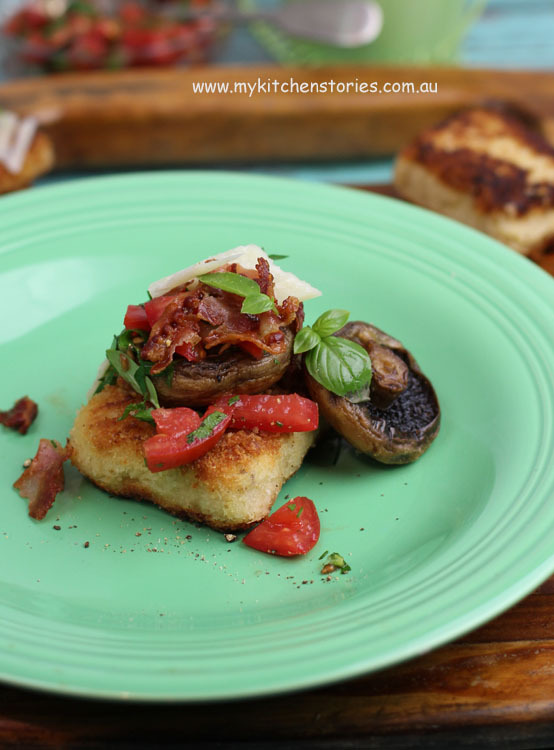 Try it with some roasted mushrooms or a tomato and basil salsa with some shaved parmesan. 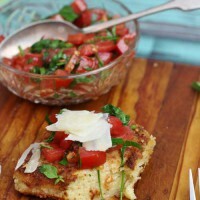 You can also eat your polenta just as it is instead of potato or rice just serve it up before chilli and crumbing. Bring the stock up to the boil and gradually add the polenta, whisking till combined. Turn down the heat and simmer slowly stirring occasionally. The mixture should be quite thick, but with enough liquid to allow it to simmer and absorb. Don't panic and add lots of extra stock. you may only need about 1/2 cup extra if any. Whisk in the goat cheese, parmesan and butter till melted and combined season with salt and pepper and taste. It will take quite a lot of salt, like mashed potatoes. Pour into your tray, cover and refrigerate till cold. (overnight or in the freezer for a couple of hours). 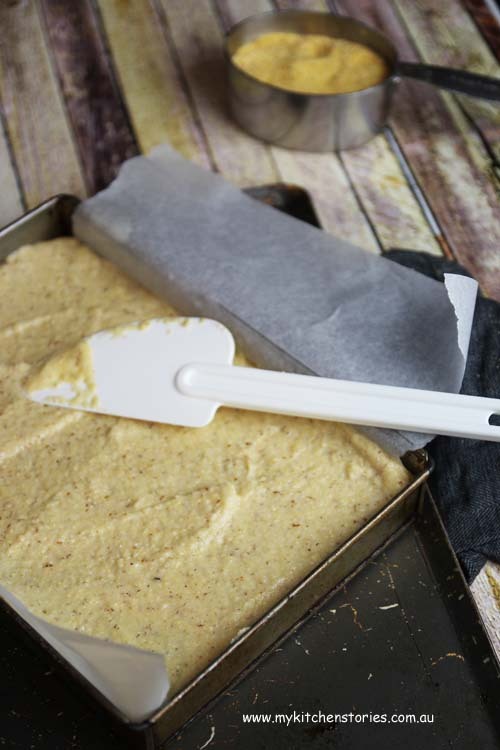 Turn the polenta out onto a board and peel off the paper. Slice into small or large squares. Mix the 250 ml milk and the egg then set out a plate of flour and another with Panko crumbs. 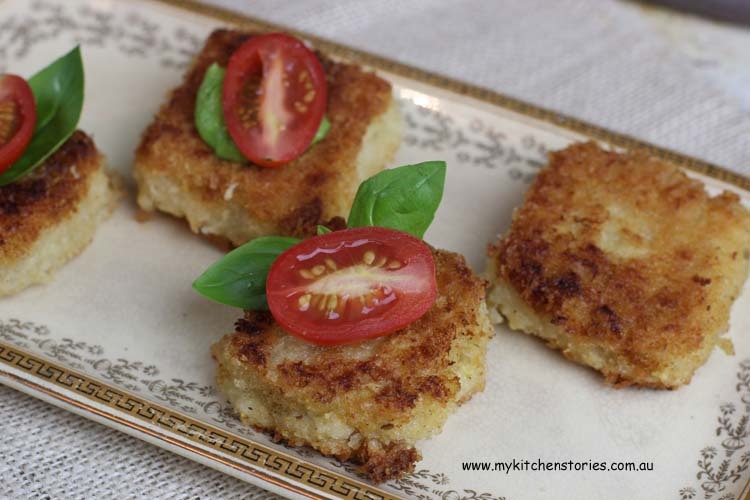 Crumb by rolling the polenta squares in flour then dipping into an egg mixture and then Panko bread crumbs. 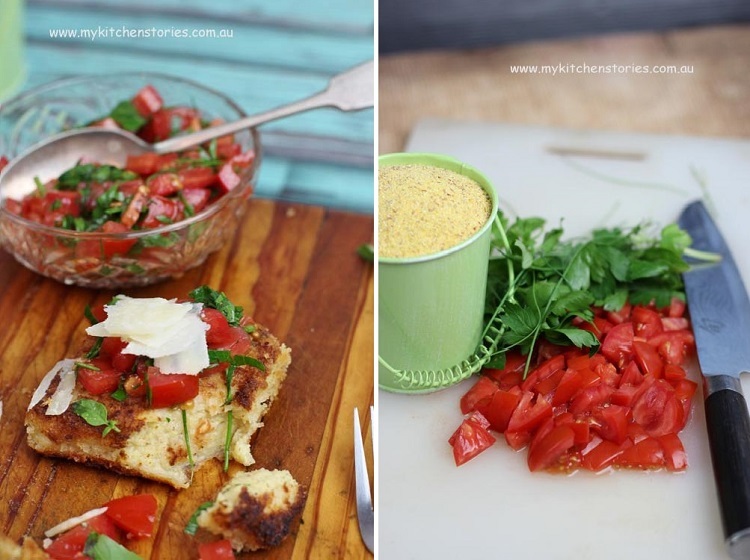 Once crumbed put the polenta back into the fridge to chill. Heat a shallow fry pan with about 1 cm ( 1/4 inch of oil. I use a mix of olive and rice bran). When the oil is hot add the polenta and brown on each side till crispy. Drain on paper. keep warm while you continue to cook the other polenta. To serve the polenta with mushrooms, line a small baking tray with paper then whisk 100 ml olive oil with 60 ml balsamic with salt and pepper and pour over the mushrooms toss together. Bake for approx 20 minutes or until the juices are released and they are tender. For very fine quick cooking polenta start with 4 cups of stock and add more if necessary. This is also great served with a tomato salsa made with chopped tomatoes, chives, parsley & olive oil with balsamic. If you like garlic add that too. Awwww I love polenta. Especially in winter with osso bucco! Yum! this sounds fabulous, id take it over bread any day! Crumbed cheese. You crafty mum. 🙂 I would have been silly and said what it was and why they should eat it and then have it left on the plate all for me. Does sound good! You’d sell me on anything described as crumbed cheese!